Black Elderberry has been used to improve health for over 4000 years, and has been called “nature’s medicine chest”. Sambucol was developed by a world renowned scientist who recognized the potential of the antioxidants present in the Black Elderberry. Sambucol Black Elderberry utilizes a unique preparation method that preserves and maximizes the naturally occurring health benefits of the berry. Sambucol for Kids is specially developed for use by Kids ages 2-10, and is a great tasting way to make sure they are getting the immune support they need. Sambucol for Kids is free from dairy, nuts, eggs, grains and gluten. Non-medicinal ingredients: Glucose syrup, Purified water, Citric acid, Potassium Sorbate. Children 9-13 years: Take 20 ml 3 times daily. Do not use if you are allergic to elderberries. If pregnant or breastfeeding, ask a health professional before using. Sambucol® was first developed in 1991 and has since gone on to become a supplement that is relied on and trusted by loyal users the world over as a great way to get a daily dose of antioxidants. 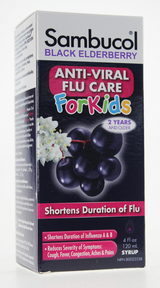 Elderberries have been used for centuries to help with countless ailments from the flu and fever to colds and colic. The work of a leading scientist brought the health-giving properties of the black elderberry to the modern pharmacy and health food store. Sambucol® is the product of nearly 20 years research, making it the most extensively researched elderberry extract in the world. The activity of the flavanoids – naturally occurring antioxidants - are preserved through a unique manufacturing process.